Don't stare at the Sun! It’s a warning that you may have heard as a child, and certainly you would never want to stare at the Sun through a telescope. But in the case of the Alice instrument on the New Horizons spacecraft, we not only allow Alice to stare directly at the Sun - we encourage it! 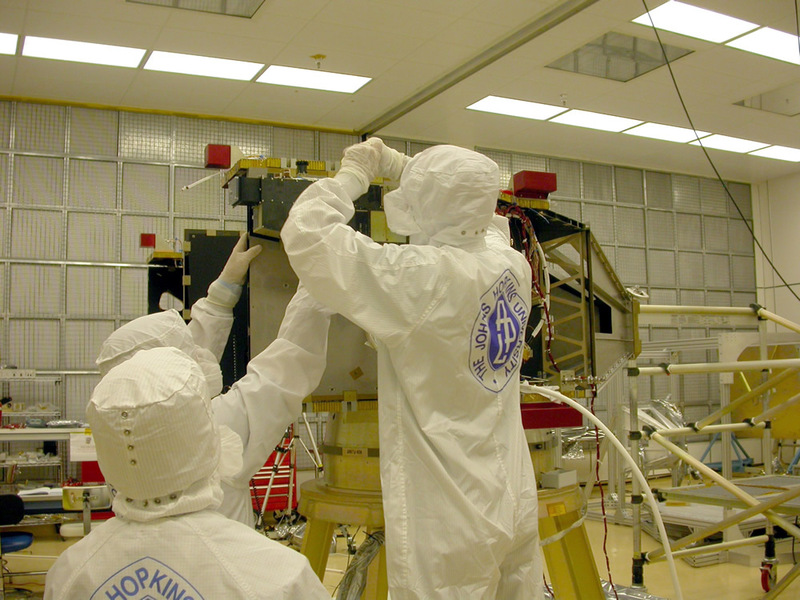 Attaching Alice: Technicians at the Johns Hopkins University Applied Physics Laboratory in Laurel, Maryland, install the Alice ultraviolet imaging spectrometer on New Horizons several months before the spacecraft's 2006 launch toward the Pluto system. Alice is an ultraviolet spectrometer that will be used to study Pluto's atmosphere in several ways. Much of the time, Alice will be studying different gases in Pluto's atmosphere using its large "airglow" aperture. The airglow aperture is about 4-by-4 centimeters square, and feeds straight through to the primary mirror, bouncing off that through a slit to the grating that breaks the ultraviolet light up into a spectrum, then from there to a detector to measure the brightness at various wavelengths. The relative brightness at different wavelengths, the "fingerprints" of different atoms and molecules, will tell us what is in Pluto's atmosphere as well as other details such as the proportions of the gases it detects. When approaching Pluto with the Sun illuminating Pluto’s disk and reflecting back at the spacecraft on approach, we will search for and study various spectral lines of species like nitrogen and hydrogen atoms, carbon monoxide, and noble gases such as argon. However, another way to study the atmosphere is to shine some bright light source through Pluto’s atmosphere and see how the atmosphere absorbs the light at different wavelengths. So, where could we find a bright light source to do that? Well, how about ... the Sun? Once New Horizons flies past Pluto, the trajectory will conveniently (meaning, carefully planned for many years) fly the spacecraft through Pluto's shadow, creating an effect just like a solar eclipse here on Earth. So we can (and will) just turn the spacecraft around and stare at the Sun, using Alice as it goes behind Pluto to measure how the Sun's ultraviolet light changes as that light passes through deeper and deeper parts of Pluto's atmosphere. This technique lets us measure the composition of Pluto’s atmosphere as a function of altitude. Since Alice is too sensitive to look at the Sun directly through its main airglow aperture, it was designed with a second aperture, called the Solar Occultation Channel (SOCC), which is a pinhole only 1 millimeter in diameter on the side of the instrument. When the spacecraft starts to pass through Pluto's shadow, we’ll point that pinhole toward the Sun; the SOCC reduces the sunlight just enough so that Alice can make those measurements without going blind. We practiced this in space on the way to Pluto to perfect the technique. New Horizons will also pass through Charon's shadow, by design, allowing us to make a very sensitive search for an atmosphere around Pluto’s largest moon. We don’t know if we’ll see an atmosphere around Charon, but we do know that the entire Pluto system will be full of surprises! Joel Parker, a New Horizons co-investigator from Southwest Research Institute in Boulder, Colorado, serves as project manager for the Alice instrument and is a director in SwRI’s Planetary Science Directorate. He’s an observational astronomer who has been studying Pluto and the Kuiper Belt for over two decades using ground-based and space-based telescopes.